These extra heavy-duty springs are just like the bias springs that were stock on 1968-72 A-Body with high-performance 340 engines and 1967-71 B-Body and 1970-74 E-Body with 440 or 426 engines. They fit 1964-75 A-Body, 1966-72 B-Body (22" front, 36" rear), and 1970-74 E-Body regardless of engine size. Front bushings installed. These springs control torque roll, providing equal bite on rear wheels and eliminating axle windup. The rear doesn't lock up; it moves and keeps tires planted. 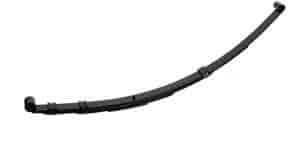 Rear springs have a 20" front segment & require a longer hanger bracket for B/E/F/H-Bodies (not included). A-Body uses standard brackets. These reissued springs are ideal for oval track vehicles and widely used on dirt track race cars. 20.5" front, 35" rear. 120 pounds-per-inch spring rate. Does Mopar Performance P3690460 fit your vehicle?